Using stranded wire (woven of multiple wires), these clotheslines give you more flexibility than solid wire lines, making it easier to use. Comes with 50 ft. of line and 6-1/2" pulleys. 4 lb. A well made product. Better line than I can buy locally. Some instructions would have been handy, like put the racket on the bottom to use the spacers, but over all a good product. Just like everyone else, I too love my clothesline. I had one already but it was rope and two small pulleys that I had done myself. Recently we took down the tree that my line was hooked to and I decided to buy a new one. This was easy to install and the cable runs very smoothly. All you need in one kit. I LOVE using my new clothesline, especially being able to hang and take down all my wash from the porch. We have purchased the spacers as well, and realized as we were installing the line that if we put the tightener ratchet on the top at the far pole, as the directions stated, it was impossible to use the spacers (which are necessary on a 75 foot distance)! So we installed the ratchet on the BOTTOM line right at my end, and I hang all the wash after it and push it out to the far pole. I have also learned to put a clothespin after the spacer so it does not roll onto my items of clothing and get caught. I've learned several little tricks, and it has made hanging wash outside a pleasure again! Love it: I have a 75' line... The pulleys are smooth and my children enjoy using it with me! My husband & I just installed your premium clothesline kit (50 ft.) yesterday and everything works as it is suppose to. Looking forward to using the clothesline this summer. Thank you. I ordered this kit to trade newspapers back and forth with my next door neighbor, without having to shovel a path through our Minnesota winters. It's perfect! I had envisioned the old-style pulley clothesline, and Lehman's was the only one to provide the entire kit. It does everything it's supposed to do, and it looks authentic, too. I love it! Everything in this kit almost works great, but my husband is very disappointed with the ratchet. After getting it tight the center popped up and it all came undone. He ended up putting a hose clamp around the lock to keep it together to avoid it coming apart with clothes on it. Line roles smooth and show work well now. We love our new clothes line kit. It had exactly what we needed. I also ordered the line spacers separately but we cannot use them with the kit. The kit has everything you need. Good product. Good price. This kit is almost perfect. We did end up buying an addition adjuster my husband calls it a turn buckle. Lehman's had the best price of any place we found & we could not find any kits or parts to make a kit locally which would come close to the cost. In my opinion there is a slight learning curve for the best use of the line. Perhaps its because I have never used this type of line but I quickly learned to put the longest dry time items on first. We purchased the 50 ft. kit and I think the longer ones would be harder to use due to possible slack/sagging not to mention the space needed for it. We placed it outside the laundry room door & ran it up the hill. The location could not be better. I absolutely LOVE it. It rolls smooth, does not sag and appears to made to last for many years. Great Clothes line.. I wish I had bought it years ago. Clothes dry faster on the line than in the dryer! Great serice! A great clothesline kit at a great price. The screw eye hooks are a little small- I upgraded them to a heavier screw eye. The ratcheting tightner has a small handle on it- we had to use a tool to hold on when we tightened it. The pulleys and the line are solidly built and should last years. I'd buy this again. My husband was sceptical, when I ordered this. He thought he would put it up for me, and I would seldom use it,but it has become an everyday thing, he mounted it off our balcony, and everyday I go outside with loads of laundry, I can stand in one place, in the shade of my porch, and hang out our clothes. Much more important, I found out within a month of looking at the electric bill, how much of a savings I was making. it pays for it's self within the first 2 month.With the cost of everything going up these days, every little bit helps. I love it. This is the second Premium Clothesline Kit that I installed in 3 weeks. You don't need to torgue the clothline tightener with any tools. Using your own strength is enough. This kit is very much worth the money. I ordered a second kit to put on my screened porch on rainy days. If you do the math it costs so little more to just order the kit than to order the pulleys, clothesline or extra tighteners separately then you'll have the extra pulleys to have on hand or give to someone else. Love, love, love the clothesline kit. Used one for years when the kids were small and I didn't have a drier. The line stayed taunt and didn't droop as long as you kept it adjusted. I always washed the line with a damp cloth to be sure the line was clean and never had a problem with it. Loved the way the clothes smelled. After I got a drier I still used it until the clothes were nearly dry and then put them in the drier and not only did they smell great but were soft and cuddly. 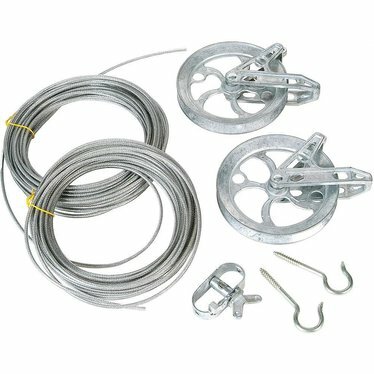 I like the quality, I bought enough for a 75 foot line bought only used 50 foot, I have tightened it with the ratchet as tight as I possibly can, and yet with wet clothes it sags quite a bit, I think I should buy the pulley system that prevents the sagging, but the reviews are not promising. I'll have to think this over to prevent the sagging. A pole would work but that would defeat the purpose of loading the clothes without moving from the porch. I used this kind of line when I lived in Canada and it is fantastic. I would hang my clothes out and take them down just before they were dry and them place them in the dryer for maybe 5 minutes and they had the best smell and were soft. It was the best of both worlds and saved tons of money on the electric bill. I have wanted another one for years and now have the chance to get one again. I absolutely love them. Mine was on a tall utility pole and attached to the back of the house with a pulley so you could raise the end on the house to be sure the clothes didn't hit the ground. You just can't beat the pulley system. I live in Suburbia USA so I do not have a barn located withing 200 feet of my house so I chose to attach it to a tree 40 feet from my second floor balcony. It was easy to install and is very sturdy, I am disturbed however that the components are imported from China, the next time I install one I will be sure to look for USA made materials. Bought 3 clothesline kits for my backyard.The ratchet was well designed but cheaply made, the washer on the end of one popped off the first time I used it. The good news is it stayed tight because the spool in the middle was skewed, the bad news is that I can never tighten the clothesline again. bought the 75 foot set, has bigger pulleys, works great, very smooth running. I love our clothesline. We love the price even more. We did have a few problems setting it up but after a couple days break and an email to Lehman's, we were able to do it. I was so excited to hang our first load! I recommend this kit. This clothesline has changed my life! I used to trudge down the stairs to the back yard to hang the clothes on a line between two trees. Oh, the miserable torture! Mosquitoes and chiggers would bite no matter how fast I tried to get the job done. Now, with this clothesline kit, I just stand in one place up on the deck and hang all the clothes from there. Wonderful, and very well made. Never found anything even half as good in the local stores. I've purchased three of these - two for us, and one for a gift. We have had the clothesline kit for over a month and it is fantastic. It was very easy to install and very heavy duty. We use it to hang wet towels, jeans, and other heavy laundry. Would absolutely recommend. What a great product! The pulleys are so smooth and the line is very rugged. I look forward to using it for many years. This is a much higher quality than any other product I've seen. While the instructions say to install the ratchet on the top strand at the end opposite of where one will stand to hang clothes, we have been satisfied with installation of the ratchet on the bottom strand of line on the end from which we begin to hang clothes. Just got the 50' kit installed. Went up like a dream. My wife says that it works very smoothly. Should help out with the cost of drying clothes. Excellent kit for the money. I ordered this for the back yard when we finish it this summer. I am so impressed! I did get more line than I needed, but this way, I have some for the basement. :) I must say, this is not your average pulley system - they are burly! The clothesline will handle jeans, towels, rugs, whatever you need to throw (or hang) on it. I am so glad to know I can still buy quality products that work! Thank you for including instructions with the order. I love the clothesline and how it works! My only complaint is that the ratchet portions are made of poor metal. My pliers took little pieces out as I was tightening and one of the little wings on the turning portion of one ratchet broke too. I think that there is room for improvement on this part of the product. Fantastic product. Make sure to get the kit with the ratchet tensioner, it makes it so much easier. Also make sure to use the eye at the bottom of the pullies to keep them verticle, or sheets will twist the lines in the wind. This is a great deal, all the parts together. And it works like it should. I highly recommend it as well as the clothpins Lehmans sells, heavy duty! I'm crazy about my pulley clothes line. It's right off my deck so I don't even have to walk into the yard. We've had it for years and still works like the day we purchased it. This is a great product. Easy to install, and the wheels are extremely smooth. The line is heavy duty. I could not piece the same quality clothes line together for cheaper. I went back and forth on getting this kit, trying to decide if I wanted to cobble together my own clothesline from separate parts at the hardware store to try and save a few dollars. In the end, I went with this kit and am quite happy with it. The line itself is extremely high quality steel cable with a heavy plastic/rubber coating. The pulleys actually have ball bearings and run very smoothly. The only nitpick I have is with the tensioner. It is cast aluminum and I was afraid to crank it too tightly for fear of breaking the handle off, but was able to get the line sufficiently taut. Best of all, my wife is happy with her fancy and functional new clothesline! My husband set this up for me last weekend. We've been married for 14 years, and I've never used a clothesline during that time. I will never buy a different one. I LOVE my clothesline. I've enjoyed using it, and doing laundry has become much less of a chore and much more of a joy. Thank you for my recent order of 50' clothesline kit. It is outstanding quality. I love to hang clothes out, even have been known to shovel snow out from under my line, so I can hang out clothes in March or April. I am going to put this to good use. Thanks again for the excellent quality & fast handling & shipping. I absolutely love this product. My husband installed it on a post off our deck way up into a maple tree...our clothes happily flap dry in the breeze and all I have to do is take a few steps onto the porch to bring them in and out! Lovely! Holds plenty of weight...our second season with it and no complaints! I bought two spacers to go with ours and an extra set up line as we have a long distance to cover. This is an excellent product.I have had clothes lines for about 30 years and this is the first one that the does not stretch and droop when it is filled with clothes.I was pleased with how smooth and quiet it was during hanging clothes out. Also the coated wire will not stain the clothes. The plastic coated line was to thick to pass through the rachetin a manner shown in the directions. I bought a smaller gauged line and the system works great. When our original clothesline broke, I went to local big box hardware stores, small hardware stores, etc. to try to replace it. There was no one stop shopping, and I never could find the twist type cable joiner. So I thought, What about the masters of non-electric technology, Lehman's? I went on the website, and even with shipping and taxes, the clothesline kit was about $10-$15 cheaper than anything else I could piece together, without the hassle! It has worked great, and was really easy to install. I LOVE my new clothes line. It works great and was easy to install!! Thanks for putting the instructions up on your website. I love my clothesline! Doesn't come with instructions. Like Post type and depth, how much line to feed into the ratchet, does ratchet go on top or bottom. No doubt I will figure it out. Even a picture would have been helpful. By chance I read the detail about the pulley and found the purpose of the eyelet.